Quick tips to help eliminate the dreaded banana ball once and for all. Ever wonder what causes a slice to curve? 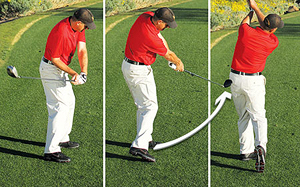 Either your hands don't rotate enough and you hit the ball with an open face, or you have an out-to-inside swing path. Ever wonder what causes a slice to curve? 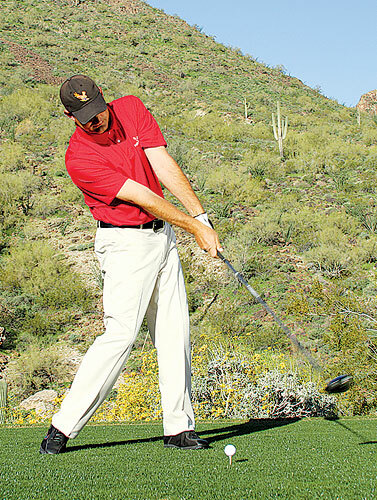 Either your hands don’t rotate enough and you hit the ball with an open face, or you have an out-to-inside swing path. When either of those things happen, the clubhead then applies a mixture of backspin and sidespin to the ball, resulting in a big curve to the right. To combat the slice, try to put the opposite type of spin on the ball, which is forwardspin with a mixture of sidespin to the left. I like to think of a tennis player attempting to hit a hard, baseline shot with a lot of topspin so the ball just barely clears the net and curves back down toward the ground. Using a tennis player as a mental cue will not only help you clear your hands and rotate them through the shot, but also prevent you from shifting your weight too soon to the forward leg, which also can cause a slice. 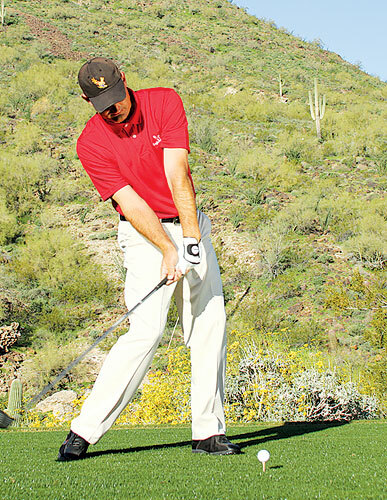 A quick way to eliminate the slice is to do what I call the split-grip drill. 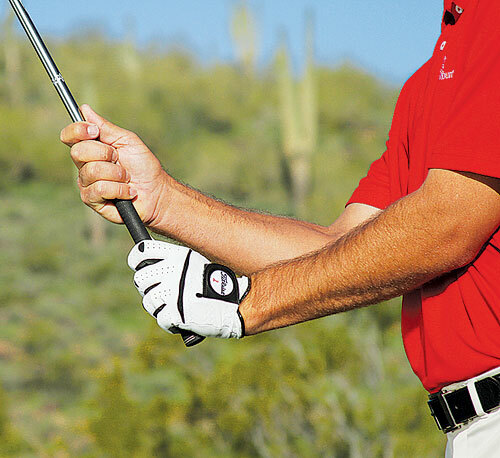 First, take your normal grip, then slide your ungloved hand down the shaft toward the clubhead and stop once there’s about an inch or two of separation between the hands. 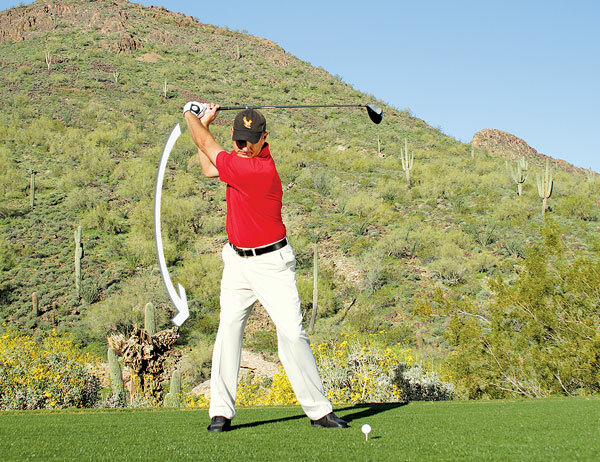 At this point, even before you swing, you should already feel a sense of the hands being very active, and it should feel as though it’s very simple to swing and roll the hands through the impact zone. 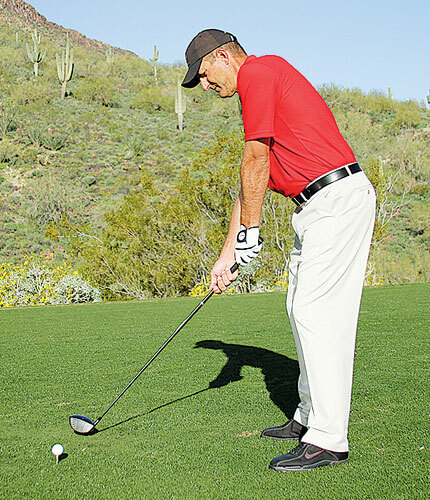 Take a few three-quarter practice swings and try to simulate the finish position that I show in the photo above. Notice how my left hand has completely rotated, and my right arm is extended through the swing. After a few tries, go back to your normal grip and repeat the process. 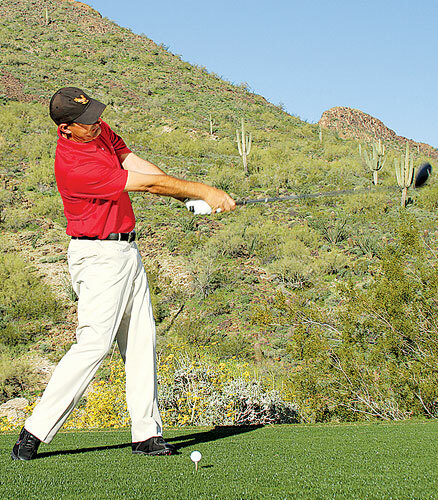 You should get a better sense of rotating the clubhead through the hitting area and squaring the clubface at impact. Another great way to kill a slice is to train your body to swing the club more from inside the target line to outside the target line. Reason being, if you swing inside to outside, the clubhead will likely produce draw spin on the ball, helping to not only reduce slice spin, but also add some power to your golf shots. 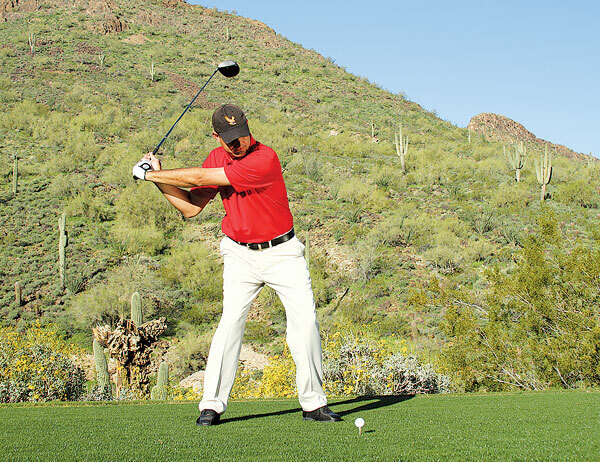 To practice, tee up your golf ball as you normally would, then set two additional tees on the ground. Put one about two inches behind and to the inside of the target line, and another about two inches in front and to the right of the target line. 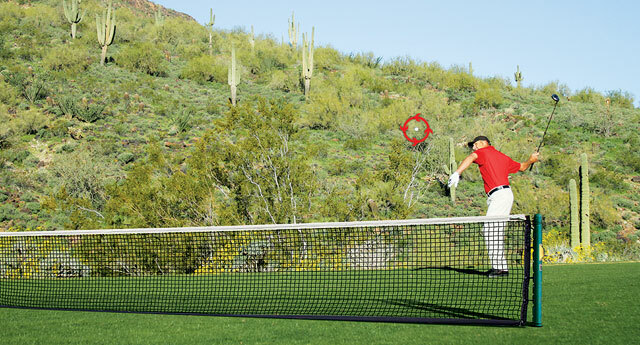 As you swing, try to either clip all the tees through the shot or, at the very least, pass over all the tees. 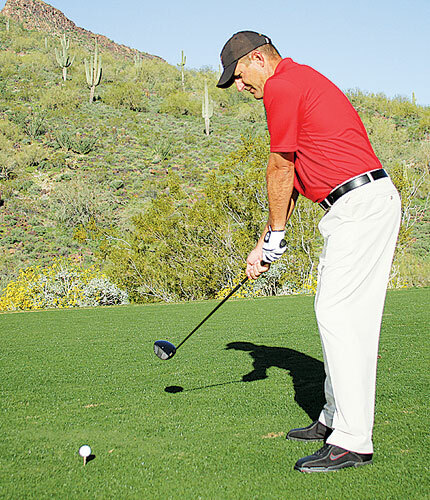 If you opt to perform this drill without using a ball, try to clip all three tees and see if you can pop all three of them out of the ground in one single pass. 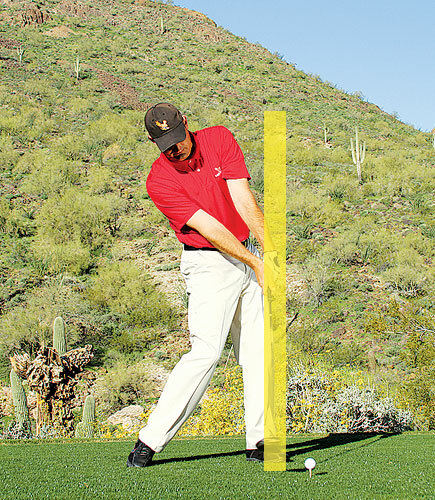 Use this drill to practice swinging inside to outside the target line. You’ll see that slice quickly disappear. One of the fastest ways to stop slicing is to allow the arms to drop down at the onset of the downswing. Here I am at the top of my swing. I’ve made a good coil, my weight has shifted to my right leg, and I’m ready to unwind. This is the moment many slicers get mixed up. Instead of trying to immediately shift my weight and start rotating toward my forward side, I consciously make a move downward with my arms. In other words, I let them drop down just as I begin to unwind my coil and start rotating through the shot. 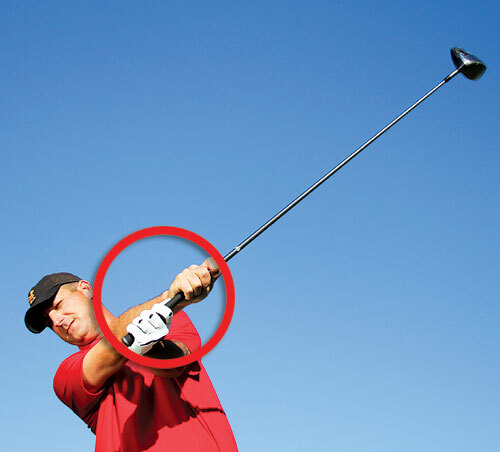 If I don’t do this, and instead leave my arms up as I rotate, it’s likely I’ll be too late into the downswing to release the arms, and I’m likely to come over the top of the ball and either smother-hook it or hit a big fat, left-to-right slice. Go ahead and give this tip a try, and if you can find a full-length mirror, check to see if you can mimic the middle and lower photos you see on this page. In the middle one, my arms have clearly dropped before I’ve made my complete turn. In the lower photo, as my body turns, because my arms were in a dropped position, not only will I avoid coming over the top, but I’ll also be more prone to swing from inside the target line to outside the target line. Again, this is a great way to kill that slice! Finally, to deliver a knockout punch to a slice, try to stay behind the golf ball as you make a golf swing. Now, before you read further, it’s important you know exactly what that means. 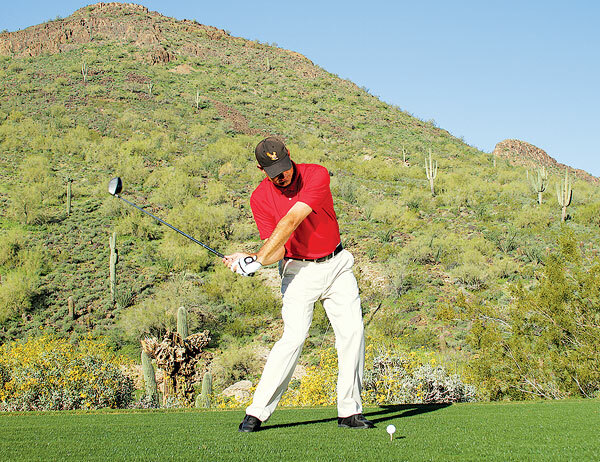 Staying behind the ball doesn’t mean limiting your rotation or your weight shift toward your forward side. Rather, staying behind the ball means keeping your spine tilted away from the ball at impact and bracing against a strong left side. Notice the constants in all four of the sequence photos above (by the way, the photos on the opposite page are part of the same sequence, in case you were wondering). The first constant is the spine tilt away from the ball, as shown by the tilt in my shoulders. This tilt will help me swing from the inside of the target line, as well as help me drive my hands through with a full extension of the arms and rotate the clubhead so it’s square at impact. The second constant is my head. It stays behind the ball through the hit and keeps me from sliding or swaying. Finally, the third constant is in my left leg. Notice that although my weight has shifted, my left leg hardly budges. This enables me to pivot my body more effectively and rotate through the shot. It also adds some whip to my arms and hands, again helping me to square the clubface at impact. Practice these three constants and work on staying behind the ball, even as you rotate and shift your weight through the shot. If you can master these fundamentals, your slice will be a thing of the past. 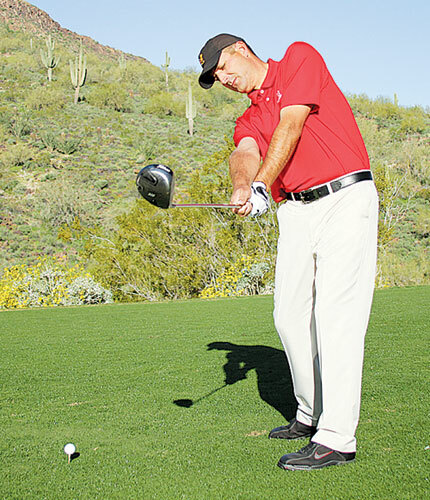 Derek Nannen, PGA, is the head teaching professional at the Eagle Mountain Golf Academy at Eagle Mountain Golf Club in Scottsdale, Ariz.